Geetha Govindam, starring Vijay Devarakonda and Rashmika Mandanna, has made a superb collection at the worldwide box office on the first day, and has become one of the top 10 biggest Tollywood openers of 2018. Vijay Devarakonda has delivered back-to-back hits like Pelli Choopulu, Arjun Reddy and Mahanati and their success generated a lot of hype for Geetha Govindam. The promos of his latest film impressed the viewers and created a lot of curiosity about the movie. The hysteria surrounding the film helped makers sell its theatrical rights a record price of Rs 15 crore. Distributors also made grand arrangements for its release. The hype and promotion helped Geetha Govindam register massive advance booking for its opening day. After seeing the huge booking and screen count, trade experts predicted that the movie would start with a bang and make a record-breaking collection at the worldwide box office on the first day. The Vijay Devarakonda and Rashmika Mandanna starrer was premiered in over 160 screens in the US on Tuesday and witnessed a good response everywhere. Geetha Govindam collected $398,962 at the US box office in the preview shows. The film became the biggest opening Telugu movie of 2018 in the country. Idlebrain Jeevi tweeted, "#GeethaGovindam collects $398,962 from 156 locations with per location average of $2,557 in USA on Tuesday! Huge number for Vijay D and 4th highest premiere gross for a Telugu cinema in USA this year! Superb." 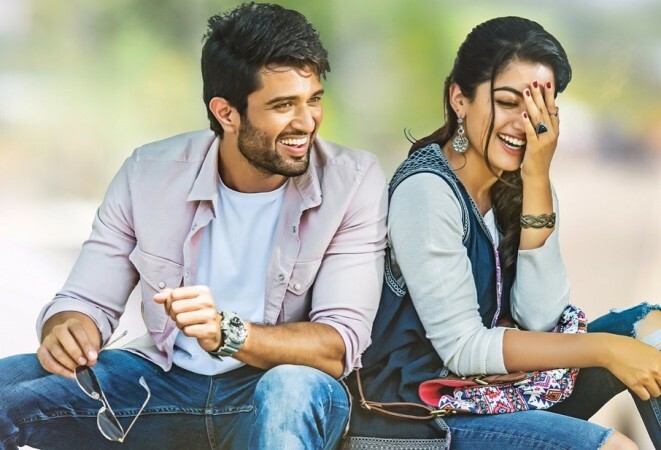 Geetha Govindam started on a grand note in the early morning shows in Andhra Pradesh and Telangana, where it witnessed houseful shows almost everywhere. The film received positive talk, which boosted its collection in the later shows on the first day. The movie registered an average of 80 percent occupancy in the Telugu states on its opening day and it is a record response for a young actor like Vijay. The Parasuram-directed romantic comedy film also received a phenomenal response in Karnataka, Tamil Nadu, Mumbai and other parts of India. Geetha Govindam has also done a fantastic collection at the box office in the US, Australia and other key international markets on the first day. The makers are yet to reveal its first-day business. As per early estimates, Geetha Govindam has collected over Rs 16 crore gross at the worldwide box office on the first day. Suresh Kondi tweeted, "#GeethaGovindam off to flyer..!! WW gross on Day 1 is 16cr. Excellent. @TheDeverakonda's Craze Will have a strong Weekend. @iamRashmika"
Here are the theatrical rights' prices and the area-wise earnings of Geetha Govindam. These are estimated numbers and they may not match with actual ones released by the makers or distributors. All the figures are in Rs and crore.